The residents lost access to the estate’s original communal boiler “submarine” after it was handed over to a controversial PFI (private finance initiative) redevelopment on the neighbouring estate, where hundreds of council homes have been demolished and more new properties, many for private sale, have been built. That area has been marketed as “Oval Quarter” – near all the attractions of the city and now private homes and shops are benefiting from the heating system that previously warmed Lambeth’s tenants. The residents are worried that they will be faced with unaffordable bills, particularly as the homes on the estate are poorly insulated and many of the residents are elderly, disabled or have young children, so particularly need to keep their homes warm all year round. One of the early residents to get a boiler fitted was alarmed to discover that British Gas had underestimated her monthly payments and that she was £350 in debt. She is now worried about being able to pay her rent, and is scared to turn the heating on. Myatts Field South has 313 homes. Two hundred and ninety residents signed a petition to Lambeth Council demanding a replacement communal heating system, but despite £4.5m being earmarked for it and a feasibility study stating that a new communal system would be cheaper in the long-run, Lambeth Council is pressing ahead with installing individual boilers, and through a combination of promises (new kitchens) and intimidation, have succeeded in installing quite a lot. The council originally said that with this option money could also be spent on insulation for people’s homes which would cut their bills. However, there is no sign of this happening. Despite differences in the size of their households, their energy use, income, and whether they are tenants or leaseholders, residents are united in wanting the best for their estate. They are also furious at Lambeth, saying their views have been ignored and their choices over-ridden, money has disappeared without explanation, promises have been broken, safety has been compromised, and some tenants are now paying the price with rocketing bills and freezing homes. They also say many tenants ended up accepting individual boilers because the communal system has been allowed to decay through lack of maintenance, leading to frequent break-downs. However, they believe there is the potential to make theirs a model estate, environmentally friendly and free of fuel poverty. Make good on their commitment to ensure tenants don’t pay more if they use prepayment meters, with a card or a key. 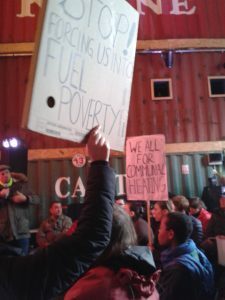 Myatts Field South tenants are being supported by Fuel Poverty Action and by Action on Energy, Brixton, and are actively seeking support and help from politicians, engineers, heating experts, asbestos experts, pensioners groups, and others. Get in touch if you’d like to be part of supporting residents determined to win a heating system that works for everyone! Next PostNext Time to warm up?